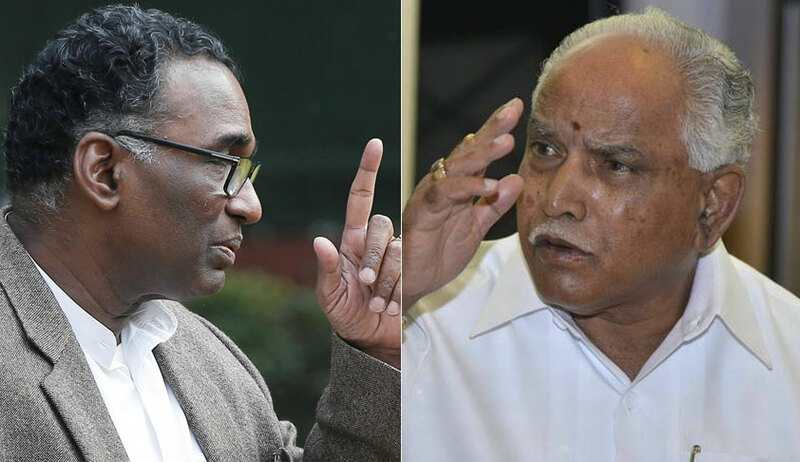 Justice J. Chelameswar, on Monday, recused himself from hearing Appeals challenging the quashing of sanction for prosecution of ex-Karnataka Chief Minister B.S. Yeddyurappa in land scam cases. The order of the Bench, which also comprised of Justice Sanjay Kishan Kaul, reads, "List the matters before the Bench of which one of us(Mr. Justice J. Chelameswar) is not a member." The Court is hearing Appeals filed by the State as well as the Petitioner, Mr. Sirajin Basha, impugning the High Court verdict which had set aside the sanction granted by the Governor of Karnataka and had remitted the matter back to him for reconsideration. The Governor's order had accorded sanction under sub-section (1) of Section 19 of the Prevention of Corruption Act, 1988, and under Section 197 of the Code of Criminal Procedure, 1973, to prosecute the then Chief minister for the alleged offence under Section 405 of the Indian Penal Code, and Section 13(1)(d) and Section 13(1)(e) of the Prevention of Corruption Act, 1988. Mr. Yeddyurappa had then approached the High Court, contending that there was no material before the Governor to show that denotification of acquisition of land was for his benefit, as no property was entrusted to him and, thus, no offence can be said to have been made out under Section 405 of the Indian Penal Code, for which sanction had been accorded. He had also submitted that the denotification orders have not been set aside, or even stayed by any court of law. Accepting such contentions, the Court had observed that as the complaint was a private one, “great caution and proper application of mind was necessary, particularly (on) the uneasy relationship between then chief minister and governor”. The Bench had then quashed the sanction order, noting, "With respect, the caution that ought to have been exercised is absent in this case... Non-consideration of the relevant matters made the order of sanction illegal and resulted in failure of justice. We are thus of the opinion that the exercise of power by the Governor was not in accordance with well settled principles for sanctioning prosecution."